Nearly half of the senior and juniors have declared minors, a breakdown of minor declarations has revealed. Of those declared, Arts and Humanities and Global Affairs (GA) proved the most popular. 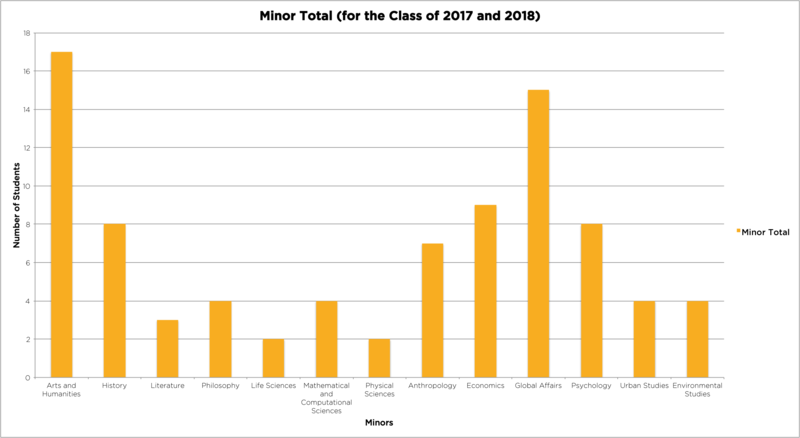 The breakdown, obtained by The Octant, revealed that approximately 42% (87 students) of the class of 2018 and 2017 have declared a minor. Of those students, 17 students declared as Arts and Humanities and 15 declared as GA, accounting for nearly 40% of minor declarations. Despite an increase in popularity in majors, science minors saw few declarations, with only 8 students declaring as science minors. Arts and Humanities and Global Affairs had the most declarations among the inaugural two classes. Dean of Faculty, Steven Bernasek, said the number of students declaring a minor was not surprising. He said that the number is probably comparable to other institutions, although he did not have data to support that statement. Mr. Bernasek added that the number of minor declarations may be indicative of broad liberal arts thinking and the desire to have add another “credential” to theirs CVs or transcripts. The heads of studies interviewed by The Octant said motivations for declaring minors were varied. Nancy Gleason, head of studies for GA, said that GA minors came from all divisions of the college. She added that the minor tackles a broad range of current affairs and transboundary issues, which could help enhance capstones in other fields. Students echoed Ms. Gleason’s sentiments. Tamara Burgos Rojas ’18, a GA major, said she decided to minor in economics because she wanted to complement her major with quantitative analysis. “For my capstone and my career […] the skills I need would not be complete without economics,” she said. Despite 87 students declaring minors, only 8 students declared a science minor — less than 10% of minors. While he said he hadn’t given the subject much thought, Division Director of Science, Mark Bussell, said that it could be because Social Science and Humanities majors were less likely to cross over to Science for a minor. “It also suggests that science majors aren’t dipping their toes into one of the other science majors to get a minor and frankly I don’t have an answer to that,” he said. Currently, students can minor in 13 different subjects: Arts and Humanities, History, Literature, Philosophy, Life Sciences, MCS, Physical Sciences, Anthropology, Economics, Global Affairs, Psychology, Urban Studies and Environmental Studies.